I’m using a control number during imports that I pick up with a Replace Heater from a .csv file. This number can only be used one time. At the time of the import I would like to advance that number. I can run a second def advance the number in question but it writes it to a new line. What is the best way to handle this? In your case you have to define one parameter (e.g. ID). Set the default value to the desired one and activate the option “store”. With this FlowHeater creates automatically a new file [definition name].fhpara to store parameter values for the next run. 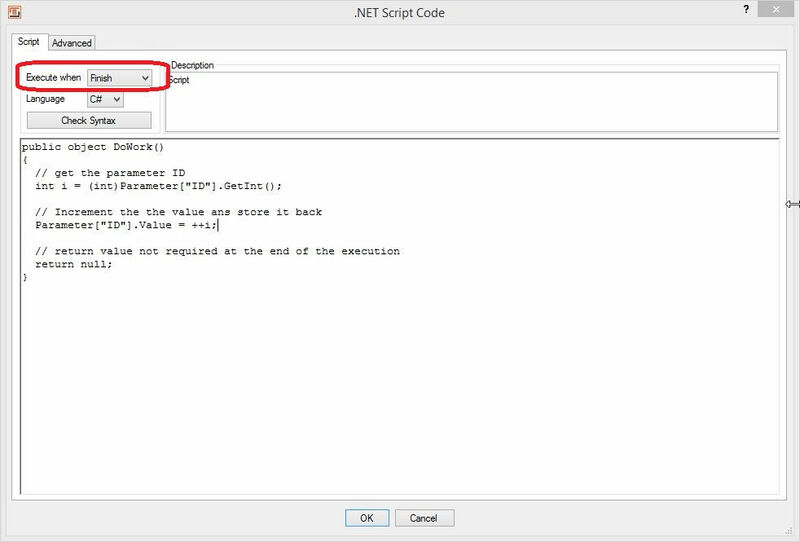 To increment the value just once per each run (not in test mode) you need a .NET Script Heater with the little script below. In the configuration dialog you have to set “Execute when” to “Finish”. With this setting the value are only increment once at the end of the import/export process. Note: The value are automatically stored when you execute the definition. When you execute the definition just in “Test mode” the parameter values are not changed! Attached you´ll find a little example how it works. Wow, that is way better then what I was trying to do. Robert I can not thank you enough. The power of FlowHeater makes my job so much easier it works great.